90 Marion. Iowa. May 8. 1922 The Cary Club met at the home of Pres Mrs Wilson. Club called to order by Pres. Fourteen members answered roll call by quotations. Minutes of Apr 24 read and approved as read. The Pres. Mrs Wilson presented a bill of 2.11. cents for sweet potatoes. the Clubs apportionment for Community dinner. The bill was allowed. the $2.11. two dollar 11 cents to be taken from treasury. Election of officers resulted in Mrs Shumack President. 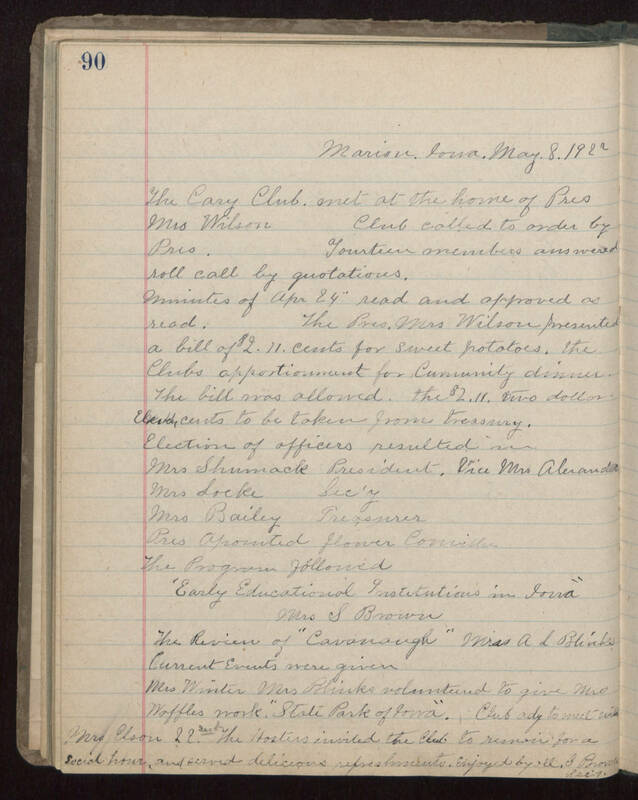 Vice Mrs Alexander Mrs Locke Sec'y Mrs Bailey Treasurer Pres appointed flower Committee The program followed 'Early Educational Institutions in Iowa' Mrs S Brown The Review of "Cavanaugh" Miss A L Blinks Current Events were given Mrs Winter Mrs Blinks volunteered to give Mrs Waffles work." State Park of Iowa." Club adj to meet with Mrs Elson 22nd. The hostess invited the Club to remain for a social hour and served delicious refreshments. Enjoyed by all. S Brown Sec'y.